You are here: Greenwich / News / Nike sculpture unveiled in Woolwich – but could it move to Greenwich? Nike sculpture unveiled in Woolwich – but could it move to Greenwich? A BRONZE statue given to London by Ancient Olympia was unveiled yesterday morning in Woolwich. The four-metre tall sculpture, which Greenwich.co.uk exclusively revealed last month would be presented to the Royal Borough of Greenwich, is of the Greek goddess of victory Nike - pronounced neekay. 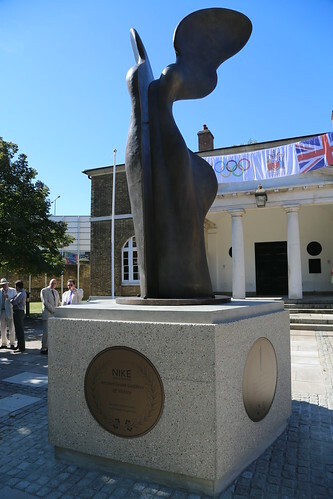 The 700kg sculpture was a gift to the London for its staging of the Olympic games - a ritual that has taken place after every Olympics since 1996. The last minute cancellation of special guest, Olympian Jonathan Edwards, did little to dampen the enthusiasm as a crowd gathered under the baking sun for the ceremonial unveiling at the Royal Arsenal yesterday. 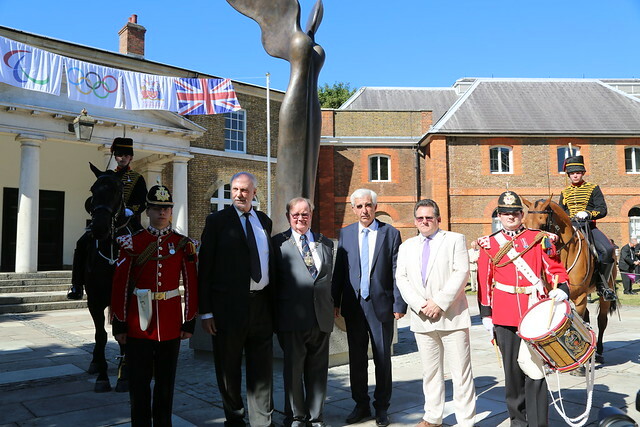 Members of The King’s Troop Royal Horse Artillery formed a mounted guard at the ceremony and speeches were made by the Mayor of Greenwich, David Grant, the designer Pavlos Angelos Kougioumtzis, the mayor of Ancient Olympia, Efthymios Kotzas, and the leader of Greenwich Council, Chris Roberts. Mayor David Grant said the borough was "very proud indeed to be the recipient" of what was a "wonderful gesture of generosity and of altruism" from Ancient Olympia. Leader of Greenwich Council, Chris Roberts, said: "When, in accordance with tradition, London was offered the statue of Nike as a gift from Ancient Olympia, I think it's fair to say that Greenwich was out of the starting blocks faster than Usain Bolt... It is a great honour for us to have been chosen to receive this gift on behalf of London." Should Nike be in Greenwich? Berkley Homes have made a site for Nike available off Dial Square within the Royal Arsenal at Woolwich but could the statue be moved elsewhere in the borough? "We wanted it close to one of our Olympic venues," said council leader Chris Roberts. "We wanted to do this within the Olympic period and most of Greenwich was obviously not available during the games. I guess we could move it if that's what people wanted." Councillor Grant, who represents the Greenwich West ward, used his remarks to say that the "wonderful piece of art" would "grace this spot here in Woolwich and wherever it may be in times to come." Statue designer Pavlos Angelos Kougioumtzis was clear about where he would like to see the sculpture placed. "Here in Greenwich, Nike gets an additional meaning. She becomes, thanks to the Greenwich Meridian, the only sculpture in the world to span the two hemispheres. One half on the western, the other on the eastern part. This effect can be expressed by positioning the sculpture in the proper location and letting small laser beam or a stainless steep rod to go through the vertical opening." Another piece of public art has been proposed in Woolwich to mark its role as a London 2012 host venue. I say move it to Greenwich Park. That was one of the Games venues, after all. 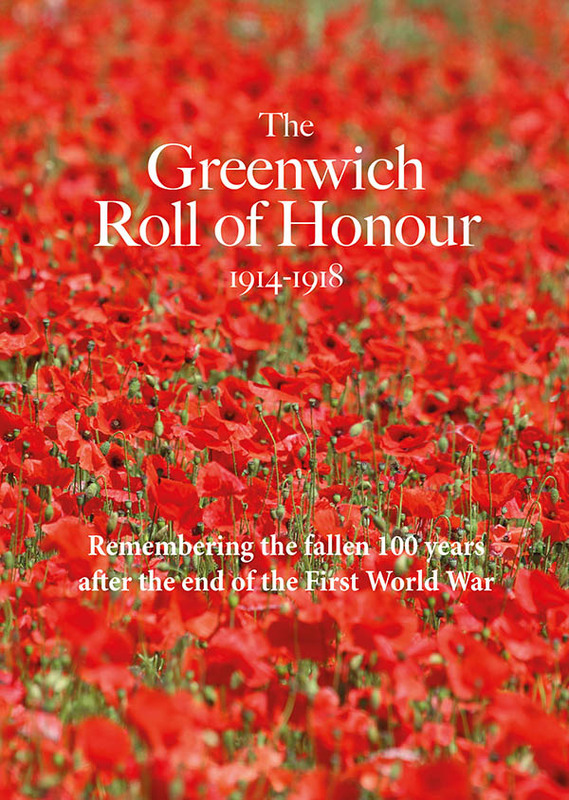 While Woolwich had the shooting and so on at the Barracks, they are some way away from the Arsenal entrance, whereas Greenwich Park did host the equestrian events. Star of the show yesterday was the soldier who kept control of his restless horse while it stood in the sun during the long Homeric declamation from the Mayor of Olympia. Although not on the Meridian line I think Woolwich Arsenal is a perfectly good home for the statue.